The Gazette Roundtable is back and ready to relax! There is so much to see and do in the parks, that it always feels as if there isn’t enough time to do it all. Yet, some of the best ways to spend time in Walt Disney World is to explore and enjoy the resorts. We all have the places we love to stay and the places we love to play, but what if you couldn’t leave your resort? The Gazette Roundtable tackles that tricky, and fun, prospect today! Roundtable Topic: You have one day and you must spend it all at a single resort (no parks, resort hopping, Downtown Disney, etc. ), what resort would you spend the day at and how would you spend it? Roundtable Contributors: George Taylor (Imaginerding), Fiona Doyle (DF’82), Melissa Loflin (Makin’ Memories), AJ Wolfe (The Disney Food Blog), Elizabeth Caran (Take the Monorail), Eric Hoffman (Netmongrel), and yours truly. George – This is an easy one. The Polynesian Resort is one of my favorite places to be in all of Walt Disney World. My absolute favorite place at Walt Disney World is the Adventureland bridge. To me it is a perfect Zen-like spot where the Imagineers got everything right. So, yeah, it is a pretty easy jump to see why I would like the theme of the Polynesian Resort. Another Disney-Geek satisfying reason is that the Poly is one of the original resorts. As expected, some things have changed and have been upgraded, but you still have the opportunity to walk smack-dab into the middle of some gooey, 1970s Vacation Kingdom goodness. The Poly was also the home to some pretty amazing things; the Bob-a-Round boats, the Eastern Winds and the first Disney wave machine were all Polynesian staples. But why would I want to spend a day there? Well, the grounds are wonderfully laid-out and landscaped. For a flagship resort, you get a sense of intimacy and privacy that is simply not available at the other deluxe resorts. They have great restaurants. And Ryan didn't say that I couldn't take the water launch to the Magic Kingdom and then just ride the monorail back. I wasn't hopping and I didn't go into the Magic Kingdom. I would have a great breakfast at Ohana's, lunch at Captain Cook's and dinner at the Spirit of Aloha Luau. I would spend the evening on the beach with my family waiting on Wishes and the Electrical Water Pageant...and enjoying various libations. 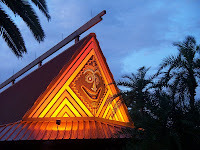 Then we would shuttle the kids off to the room (the oldest is old enough to watch his younger brother) and we would take a nice, romantic stroll among the many buildings of the Polynesian Resort. Ryan, can we go to the Magic Kingdom the next day? Fiona – This was a really tough one, for me. But I had a good think about it, and it was a close call between two. 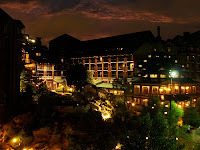 I was tempted to say Saratoga Springs, as I was lucky enough to experience their spa recently, but I decided to go with one that I love and could spend hours exploring: Wilderness Lodge. 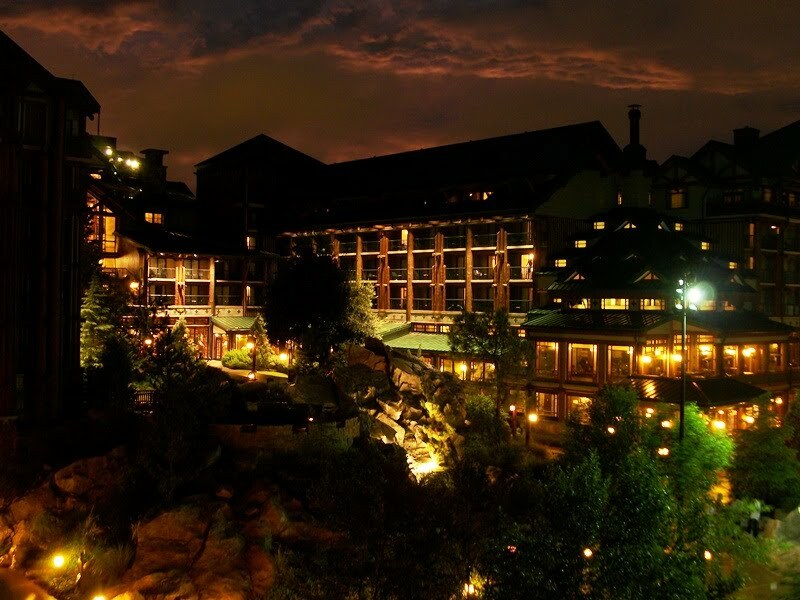 It may not have the animals that Animal Kingdom Lodge has, or the exploration levels that Fort Wilderness has, but Wilderness Lodge is one of the coziest, and most fun resorts that WDW has to offer! I would spend time exploring the lobby, wandering around the different floor levels that overlook the lobby, and searching for all the hidden treasures this resort has to offer. Once the air-conditioning had taken its toll, or if it was winter, I would settle on the rocking chairs in front of the fireplace and just relax. Of course, no visit to Wilderness Lodge would be complete without dining in the Whispering Canyon Cafe! Their burgers are to-die-for and I have five words for you: All You Can Eat Milkshake. Your mouth is watering, isn't it? I would spend some time by the pool, perhaps going for a dip if the weather was in favour. And when I just needed a rest, I would sit back and watch the boats on the lagoon. While there are plenty of things to see and do at the Lodge, it is also a beautiful place to just get some rest and relaxation. And you can end up feeling like you are right in the middle of the Wilderness, in Walt Disney World. 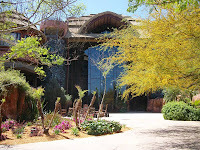 Melissa – My husband and I just recently bought into DVC and chose Disney’s Animal Kingdom Lodge as our home. We fell in love with this resort on our first stay. My ideal day at the Lodge would begin with a plentiful breakfast at Boma. Afterward, you can observe the animals on the numerous savanna overlooks around the resort grounds and, at the right times during the day, listen to Cast Members talk and answer questions about the animals and the resort. Of course, it’s not a relaxing day if you don’t spend some quality time by Uzima Springs, the resort’s pool (or in this case, African watering hole). Heading back inside, don't forget to explore the African art you’ll find around the resort’s lobby. At different times during the day you can catch resort Cast Members sharing stories and information about Africa and some of the art pieces in the lobby. You can also meet the Pin King inside the Zawadi Marketplace, where he’s ready and willing to trade pins with you. While you’re there, do some shopping. Zawadi offers up a variety of handmade African creations; from paintings to carvings to clothing, there’s something for everyone. As evening approaches, head downstairs to Jiko where you can enjoy a romantic meal, all with African flavors and flair. Of course, a seat at the counter looking into the show kitchen is a must. After dinner, head outside to listen to the nightly story telling around the firepit, then grab a pair of the night vision goggles and take in the savannas in the dark. Finally, call it a night by relaxing at Victoria Falls with a glass of African wine before calling it a day. 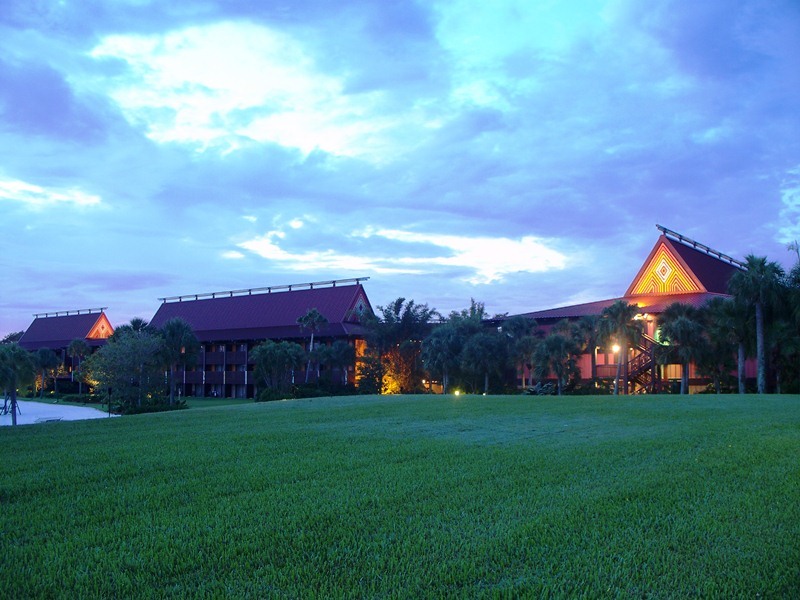 Now you’ve had a fully restful, but interesting and fun-filled day, without ever leaving your resort. AJ – Animal. Kingdom. Lodge. There's no other answer to this question, is there? My day would begin with breakfast at Boma, after which I'd head over to Zahanati Spa and Fitness center for a 5-minute jog and a 50-minute massage. I'd get to the pool just in time for the pool bar to open and talk the bartender into making me a Leisure Suit drink. After swimming for a bit, I'd have an afternoon snack at Sanaa and spend some time chatting with the cultural interpreter at the Kidani Village firepit... OR I'd head to Jiko for a wine tasting. Soon it would be time for the 4pm Culinary Tour of Jiko and Boma. Hopefully that won't overlap with my Wanyama Safari and dinner at Jiko! If we're finished in time, I'd head to the Jambo House firepit for African Storytelling followed by some night-vision goggle viewing of the animals on the savanna! Elizabeth – This is a great question to ask me because I'm pretty much a resort junkie. I firmly believe that a resort can make or break your trip and my goal is to eventually have stayed at all of them. I'm more than 3/4 done with that goal. So after pondering this question for quite some time, I realized that there are certainly factors to consider. Just like the "If you are stranded on a deserted island, what three things would you have with you?" My first question is "Where is the island? Do I need a coat?" Because if it's cold, my three thing will be way different than if it's warm. So when picking my resort, really every Disney resort has plenty to offer... so now the factors are, "Is it raining? Do I have kids with me? Do I have ANYONE with me?" Because to be fair... 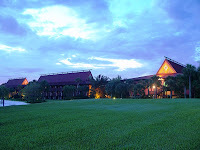 I've actually spent close to a full day in the resort on many of my trips. It's not a foreign concept to me and it's one I encourage others to do. I'm going to assume I am alone and it is NOT raining. (Although my choice would probably still hold true if I had kids with me). I would pick the Polynesian. It's an odd choice perhaps, because there are certainly resorts with more shops, more activities, and even more restaurant choices. (My second choice would be Animal Kingdom Lodge). But for a day in the resorts, I want to spend it in a place that makes me feel like I am truly on vacation... not just in a hotel. I'd sleep in, and then grab some breakfast at Kona. I'd do a little shopping and browse the art gallery downstairs, then put on my suit, grab my Nook, and head to the pool. I'd laze around in and out of the water reading reading and reading while enjoying a beverage or two from the bar. More than likely, I'd spend a little time on the beach there as well, enjoying the view of the Magic Kingdom. Since I'm alone, Ohana wouldn't feel like a fabulous choice for dinner, so I'd go to Captain Cook's and then watch the fireworks from the beach. Then I'd return to my room for television, maybe some internet time, more reading, and sleep. Low key? Why yes... yes it is. After all, let's not forget that Walt Disney World is a vacation destination. Eric – How would I spend one day at a single resort? This isn’t as hard as it might sound, really. There are a myriad of activities available at the Walt Disney World resorts. My wife and I view the resorts as destinations in and of themselves. Honestly, if you were able to experience Walt Disney World level accommodations at any of your non-Disney vacation destinations, you would be thrilled! I used to think the Yacht Club was my favorite Disney resort, but in truth the Polynesian Resort is my hands down favorite. My only problem is that I’ve never stayed at the Poly. I know how I’d spend that magical day there, however. This particular trip is a fictitious adult-only trip with a fellow Disney fanatic and best friend, my wife. Our day would start early with some coffee (hot chocolate for her) out at the end of the pier looking out over Seven Seas Lagoon. I love the relative peace and quiet of Disney World in the morning. Just hanging out there watching the day begin with the ducks and a few water craft moving about on the lagoon would be a great start to a long and entertaining day. Next up on the agenda is a hearty breakfast and character meet and great at ‘Ohana with Lilo, Stitch, Mickey, and Pluto. We have eaten at ‘Ohana before and had a great time and really enjoyed the simple but tasty breakfast fare. The views from ‘Ohana are amazing, and the character interaction with Stitch and friends is a ton of fun. After breakfast I think it might be good to get the adrenaline racing out on the lagoon itself. The Mikala Canoe Club Marina at the Poly rents Sea Raycers by the half-hour. What could be more fun than racing around Seven Seas Lagoon under the shadow of the Polynesian, Contemporary, and Grand Floridian resorts, not to mention the distant views of Cinderella’s castle? What fun! Of course there is parasailing too. Maybe just one quick trip up in the air wouldn’t hurt; there’s time! After that action packed morning, I’d say it was time to head back to the room for a short nap. Our concierge (I did mention we were staying Club Level with concierge service in the King Kamehameha Suite, didn’t I?) has arranged for a nice little early afternoon snack in our room. We can enjoy our in-room dining while we relax a bit and relive the morning fun in the spacious jacuzzi tub. Next up is a change into bathing suits so we can hit the Poly’s beach for a little sunbathing, reading, chatting or snoozing. After some time in the hot Orlando sun, the best way to cool off is to take some fast trips down the Nanea Volcano Pool’s waterslide and then some laps (leisurely laps of course) around the pool. After a quick change back at the suite (all hail King Kamehameha!) we are ready to start the evening’s festivities. We’ll just happen to arrive up at the Great Ceremonial House just in time to catch the torch lighting ceremony and then some leisurely shopping and people watching until our 8pm seating for Disney's Spirit of Aloha Dinner Show. This is a family-style luau featuring hula dancing and fire/knife performers. It is an absolute must for the perfect south-seas inspired day at the Poly. Ryan – Where would I spend my day? This should be obvious to anyone who has spent some time wandering through the Gazette’s back issues, Fort Wilderness Campground and Resort. I’d start my day climbing out of my tent and give a good morning shiver to the damp chill in the Florida air. I’d don my shower shoes, hike down to the Comfort Station and freshen up for the day ahead. Before heading back to the campsite, I’d check the community board to see if there were any extra-curricular activities going on that day. Back at the campsite, I would consider boiling some water for tea and grits, but end up heading to Trail’s End for the breakfast buffet. 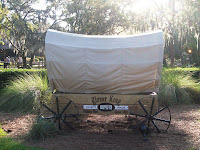 I’d spend the rest of my morning exploring the history of Fort Wilderness. I would hike through the pedestrian nature trail which passes the old Marshmallow Marsh area. 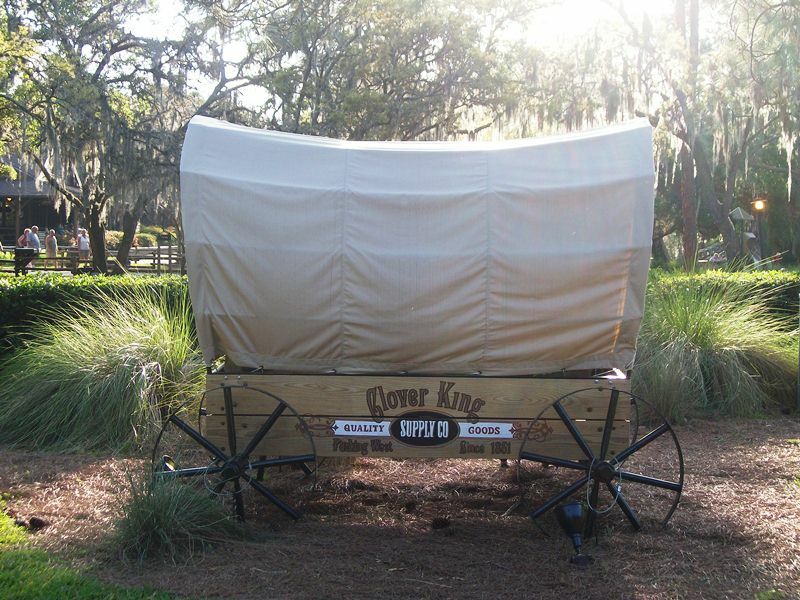 Speaking of hiking, I would probably make a point to hike along the railbed of the Fort Wilderness Railroad and venture over to Tri-Circle D to view the display on Walt’s equine history and the Dragon Calliope. Midday would call for some snacks from Crockett’s Tavern, before splashing down in the Meadow Swimmin’ Pool, where I would also grab an ice cream. After a round of checkers at the Trading Post, I would either grab a Segway tour or explore Discovery Island and River Country with a Sea Raycer. While I love the Hoop-Dee-Doo Musical Revue, I would likely grab some fried chicken to go from Trail’s End and relax on the shores of Bay Lake. Making my way back to the Meadow area, I would be sure to stop by my campsite and grab my roasting stick and bag of marshmallows. Roasting stick? Marshmallows? That can only mean one thing, campfire! I would stick around the fire pit long enough to catch up with Chip and Dale, listen to the sing-a-long with Cowboy Anthony and fill my belly with molten marshmallows. The movie under the stars would have to be skipped, unless it were Peter Pan, in order to book it back down to Bay Lake. I’d take in the Electrical Water Pageant and Wishes from the shore and then head back to the campsite. Hopefully, I remembered to plug in the little lantern lights strung about my site for some late night fudge from the Meadow Trading Post and some cards. If not, I’d call it an early night and be asleep before the sleeping bag had time to settle in around me. Now that we know where the Gazette crew would spend their days, and what activities they would fill them with, what about you? What resort would you spend a day at and how would you occupy your time?